Big Apple Secrets: Japanese Garden in Brooklyn is 100 years! 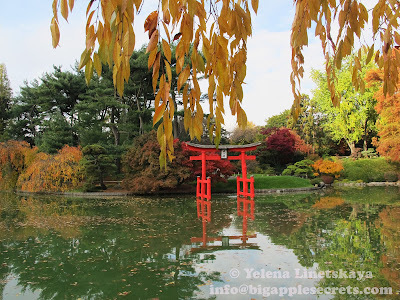 From September 2015 through June 2016, Brooklyn Botanic Garden celebrate 100 years of its iconic Japanese Hill-and-Pond Garden. The garden was designed in 1914 by Japanese-American landscape architect Takeo Shiota. It was among the first Japanese gardens constructed in an American public space. It was constructed at a cost of $13,000, a gift of early BBG benefactor and trustee Alfred T. White, and it first opened to the public in June 1915. Japanese gardens have their roots in Japanese religion of Shinto, with its story of the creation of eight perfect islands, and of the shinchi, the lakes of the gods. The earliest recorded Japanese gardens created for the pleasure of the Japanese Emperors and nobles were mentioned in first chronicle of Japanese history, published in 720 AD. The contrast between western flower gardens and Japanese gardens is deep. Western gardens are typically optimized for visual appeal while Japanese gardens are modeled with spiritual and philosophical ideas in mind. In Japanese culture, garden-making is a high art, equal to the arts of calligraphy and ink painting. Gardens are considered three-dimensional textbooks of Daoism and Zen Buddhism. 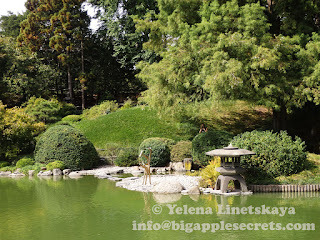 There are more than 300 Japanese gardens outside Japan. 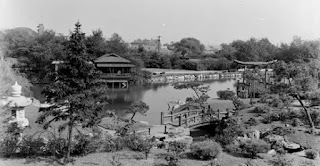 There are very few people in the world – only about 100 to 200 – that have actually created a Japanese garden in its truest form, according to the curator of the Japanese Hill and Pond Garden in Brooklyn. The 3.5-acre garden in Brooklyn combines the ancient hill-and-pond style, referencing mountains and oceans, with a more modern stroll-garden that reveals waterfalls, rocks, and wooden bridges along winding paths. Maples, cherries, and wisteria are planted for seasonal color, while pines and cypresses provide year-round cover. The pond is the only truly natural formation in the garden. It’s a remnant of a kettle pond, a depression formed by a chunk of a glacier during the last ice age from thousands of years ago. Today it is filled with hundreds of Japanese koi fish. People in Japan believe that koi fish symbolizes wealth, prosperity, love, successful career and good fortune. Each variety is associated with one of those values. Koi fish usually lives between 25 and 30 years. 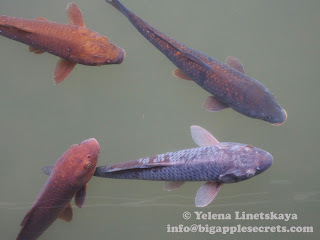 When it is kept under good conditions, koi fish can survive for more than 100 years. 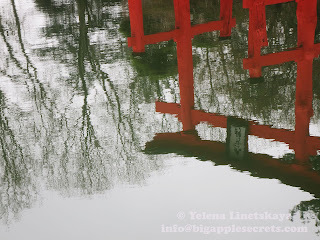 This pond, which serves as the garden’s central organizing feature, contains an island and a traditional “Torii” viewing gate which are intended to focus the visitor’s attention inwardly. A torii gate marks the approach and entrance to a Shinto shrine, it is the division between the physical and spiritual worlds. This particular torii has a notable antecedent, its design being modeled on the much larger original at Miyajima ("shrine island") , a small island less than an hour outside the city of Hiroshima, which also rises out of the water. Miyajima torii is considered to be one of Japan’s three most beautiful sights. In 1939 a shrine, build by Shiota, was burned by vandals during anti-Japanese demonstrations. The Pearl Harbor attack intensified antagonism towards Japanese Americans. The garden was closed in 1941 because of ''the public's antipathy to anything Japanese,'' the garden's 1946 annual report says. As In 1942 President Roosevelt signed Executive Order 9066 causing over 120,000 West Coast persons of Japanese ancestry (Nikkei) to leave their homes, jobs, and lives behind to move to one of ten Relocation Camps. Shiota, who designed the garden, was one of them. He died in 1943 in a United States internment camp. Garden was reopened in 1947, the shrine was rebuilt by garden staff members and rededicated in 1960. 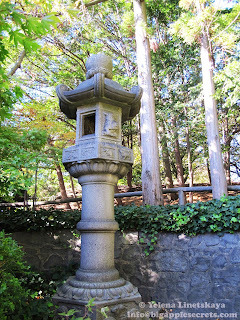 In 1980 500-year-old Shogun lantern, gift of the city of Tokyo was placed in the Garden. 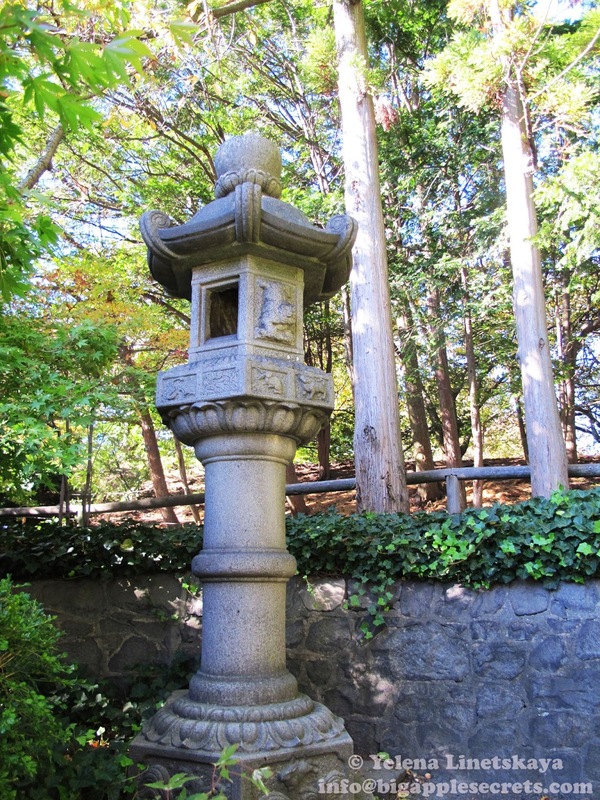 Plaque next to the stone lantern reads: "This Japanese lantern was presented to the city of New York by Mr. Bunj Sakuma a controller of Taito Ward Tokyo, in October 1980, to commemorate the 20th anniversary of the New York-Tokyo sister city affiliation. In 1652, feudal lord Naito Bunzen-no Kami Nobuteru dedicated this 10 foot high, 3 ton, komatsu stone lantern to the Tokugawa shogunate." Every year in spring Brooklyn Botanical Garden hold its very popular Sakura Matsuri (Cherry Blossom Festival), full of live Japanese musical and dance performances, ikebana and tea ceremony demonstrations. In fall it is more quiet and not so crowded. The best time to see fall foliage is just now!